Fiber optics might just be the rainbow that leads the securities industry to the legendary pot of gold, The technology can enable brokerage houses not only to achieve that tantalizing goal of mastering the smooth, uninterrupted flow of massive amounts of information that seems to be increasing daily, but of doing so at a cost savings. In addition, fiber optics offers many other information-related options, such as teleconferencing and local area networks, that many firms may finally find to be yet another cost effective-stratagem. Merrill-Lynch was the very first brokerage to move from copper cable to fiber optics. The new cable was installed by AT&T Communications and New York Telephone, now part of NYNEX. Any sort of Merrill Lynch data communications device, within the New York metropolitan area, can be hooked to the network. There is no appreciable additional cost, other than for the hardware being connected. "When a water main broke recently in lower Manhattan," says Bob Niebanck, vice president of the Merrill Lynch Telecommunications Group. "We were able to continue service. Other companies weren't. That's because we weren't on copper cable, and they were. It seems that the water got into the cable and interfered with the signal." This factor affects just about any phase in the life of a brokerage. All kinds of data get communicated through the cable from one location to another. These include electronic mail, research, client information and trading information, just to name a few. Anything sent over the copper cable is vulnerable to the vagaries of electrical interference. The development of lasers in the 1960s and pristine glass fibers in the 1970s arid the more recent aggressive digitizing of all kinds of information processes, have led to the greatest fiber optics contribution—communications. Essentially, that thin glass strand is a fabulous string that runs between two high-tech tin cans. These cables have such high capacity that a single cable can carry voice, data and video. Fiber optic cable is slowly beginning to replace copper cable. The glassing of America is beginning. Some anticipate that by 1990, fiber optics cabling will be a $5 billion industry. "The first applications," according to a Bell Labs technician, "were the long hauls—telecommunications. The consumer never saw it. It was in the large offices of telephone companies. As the material got somewhat cheaper, applications broadened. Then, it was used for smaller telephone company offices. Now, big businesses are just starting to get fiber cables into their basements: All of this is under the aegis of the telephone operating companies: Another whole aspect of where fiber will happen will undoubtedly be local area networks (LANs)-computers to computers and computers to telephones." "Fibers are thinner than a human hair," explains ;Art Taft, AT&T's liaison . with Merrill Lynch. "Copper. Coaxial cable has a diameter of approximately one-half-inch. Generally speaking, the potential conversation-carrying capacity of a pair of fibers can be 100 times greater than a pair of coaxial cables." In terms of ability to send information from one point to another, copper cable is a back countrry road and fiber optics cable a 22-lane highway. The operative concept is frequency (wave length). With a higher frequency, you get a greater band-width (a broadersized wave) and the ability to carry more information. Light waves have a much higher frequency than the electromagnetic waves that run through copper wire. Furthermore, in the spectrum that makes up light, each color has its own frequency. Right now,, the former Bell System's newly independent babies are, laying fiber optics cables within and between cities This is pleasant news for society at large The telephone operating companies will be able to offer greater greater capacity on the phone lines used by consumers. Also, addtional services might become generally' available. More interestingly; however, a few major companies are installing, or already have installed, fiber optics cables for use in their own private networks. The pioneering firms include, in addition to Merrill Lynch, Shearson/American Express and Lehman Bros.. Moreover, we are just beginning to see the first possibility of desk-to-desk fiber optics hook-ups. Now the process has been reduced to one step. Right at their original locations, the reports are turned into light and zipped through glass. Certainly it had been possible, theoretically, to send the reports directly from the various sources via telecommunications. However, these particuclar reports are so big that Merrill Lynch would have been obliged to install a veritable copper mine to accommodate the information. The use of fiber optics has made a difference. "We save about an hour on this," says Merrill Lynch's Niebanck. "If you're a bond trader and that report has inventory, that's an eternity." More teleconferencing can assist both the trading and operations divisions. One New York brokerage executive contemplated his need to travel to regional offices and also meet with vendors in other cities. He intends to substitute teleconferencing for travel as often as possible. Teleconferencing may prove to be an excellent tool for traders, as well. "We can have an industry analyst speak to some of our clients around the country," suggests one Manhattan broker. "It can be a live hook-up to various branches or to some hotel suites that we reserved around the country. The talk can be supplemented with graphic information such as films, slides, and charts. It could have a great impact." 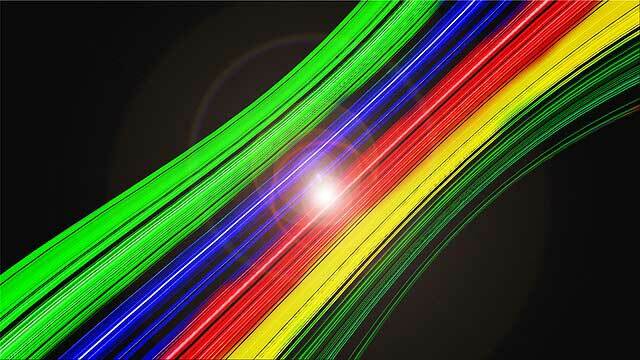 Fiber optics offers other advantages that are subtle but important. Copper cable requires much greater use of "repeaters." These are little gizmos that amplify the flagging electronic pulses and send them along. Repeaters necessarily are placed along the path of copper cable. The signal sent through the glass cable can carry for eight kilometers before a repeater is required. Eliminating the need for substantial use of repeaters cuts the cost of installation. Its very essence allows fiber optics cable to glow where copper cable falls short. High powered electric lines can play havoc with the signal that travels a copper path. However, they do not interfere with the light. Therefore, fiber optics cables can go where copper cable feared to thread. "You can put fiber optics cable in formerly hostile environments," says Ed Bertness, a Datapoint Systems senior systems analyst.. "When you hang a copper coaxial cable in these environments, the chance of damage is 100 percent. You can lay fiber optics cable across high voltage current carrying lines. You could string it in areas where interference would discourage coaxial cable. You could run it past heavy equipment." Jerry Fife of Raycom, a company that manufactures and sells fiber optics interfaces, adds that fiber optics cabling can go in elevator shafts and ceilings, "those places where electricity might preclude the use of wire." This immunity to anti-electric forces breaks down to bottom-line savings, as the folks at Merrill Lynch might quickly attest. The maintenance manager of one firm committed to fiber has seen a dramatic difference between his copper and glass charges. "With copper," he says, "we literally had at least hundreds of `noisy' circuits per month. We'd have to sectionalize the trouble and get the problem solved. For exmple, if there were flooding in the streets, We'd have to find the problem, contact Con Edison and have them drain out the manhole In the meantime, traders sending information over those circuits might have to turn to some back-up improvised system. In the less than a year that we've been on fiber, we've had a total of two problems." Fiber optic cable's relatively small size is considered to be another plus. Already we can see that the future requires so much information to be transmitted, and that means more cables to carry the goods. The competition for real estate below Manhattan's streets is fiercer than the battles waged on the surface. Fiber optics cables can be placed one on top of another (piggybacked) and still carry more information than was ever carried before. There's even space within the cable for more filaments to use for other functions at some future time. Niebanck seems especially fond of the ease with which fiber allows one to grow. "We can put in a new connection from building to building very quickly," says Niebanck, "overnight. With copper, we'd first have to order the line and then wait at least 30 to 60 days." Other companies in the fiber optics arena also are shouting LAN ho! Two fairly interesting entries are American Photonics in Connecticut and Fibronics International in Massachusetts. Both offer computer networking within a single location. Putting fiber optics cable into a single location does not require the assistance of any company remotely associated with the name Bell. Typically, the work is done by an electrician, building maintenance staff, or an independent telephone contractor. First, someone technical, perhaps consulting with the vendor, designs the plans. The major players in the fiber optics area are, of course, the Bell Operating companies. They are not alone. Also in there are ITT, Sperry Univac, GTE, United Telecom and, in Canada, the Harris Corporation. The ultimate goal for many is a magic desk (otherwise known as ISDN-Integrated Systems Digital Network). From one air-conditioned pinpoint on the planet Earth, a talented on-top-of-it individual can send and receive calls, reports, pictures, and stock market videos, all in an instant. In this laser-age, it is inev­itable that, in a very short time, brokerages will want to see the light.